Glenn Schwartz: On site in Umm el-Marra, a northern city in Syria. Since the Middle East is such an unpredictable place, archaeologists carrying out fieldwork in Syria often advise one another to conduct each field season as if it were the last. But having directed archaeological excavations in Syria since 1987, I had become complacent, accustomed to the country’s stability and the people’s warm hospitality. I visited Syria for two months almost every summer and directed work at the site of Tell Umm el-Marra, which had yielded a fascinating complex of “royal” tombs and ritual facilities from the third millennium BC. But my sunny attitude was challenged in 2011, when civil strife began and I realized that the disaster archaeologists had long feared might be taking place. As the situation worsened, I faced a major decision. Should I put an end to my fieldwork career and concentrate on analyzing and publishing the results of my many years of excavations in Syria? Some might have considered this the responsible thing to do, since archaeologists are often accused of spending more time digging than publishing their results. Or should I begin a new field project in a different country? This would be a daunting prospect at my advanced stage of career, since I would have to learn how to deal with a new culture, a new government, a new language, and new types of ancient materials. But having spent so many years developing my skills as a dig director and field archaeologist, it seemed wasteful to put that expertise and experience to rest. Moreover, part of my job is to train students in fieldwork, and this requires a field project. So, after much deliberation, I decided to take the plunge and start a new project. The question was: where? Opportunities for American archaeologists in the Middle East have diminished considerably in recent years. Countries like Iran, Lebanon, Syria, and even Turkey are difficult or impossible to work in, due to political or other reasons. But while many places were becoming inhospitable, one area was newly receptive to foreign researchers. The autonomous Kurdistan Region of Iraq has recently welcomed archaeologists from other countries, and numerous projects have been initiated. This northern Mesopotamian region, part of ancient Assyria, is rich in archaeological sites relevant to the understanding of humanity’s first urban civilization, yet it was archaeological terra incognita until just a few years ago. 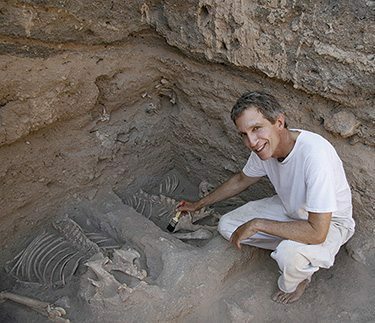 Most new archaeological projects in the Kurdistan Region of Iraq had been spearheaded by European archaeologists, and the Kurds wondered why Americans had yet to join in. This situation changed in 2012 when Jason Ur from Harvard University started an archaeological survey near Erbil, the capital of Kurdistan. Later that year, he filled me in on his results and told me about an interesting site that he had discovered called Kurd Qaburstan. An immense urban-sized mound dating to the second millennium BC (a date that Ur knew from the style of the broken pottery on the site surface), Kurd Qaburstan may be ancient Qabra, a powerful city well-known from Mesopotamian texts. Work at Kurd Qaburstan promised an opportunity to study the nature of urban life and organization in northern Mesopotamia. The next problem was getting permission to excavate. I contacted Mr. Najat Abdullah in the office of the Kurdistan Regional Government in Washington, D.C., and he was very enthusiastic about the prospect of Johns Hopkins starting a field project in his homeland. He put me in touch with the director of antiquities, Mr. Mala Awat, who was likewise interested. Thanks to their help and that of many others, I was able to get the project off the ground quickly. In fact, it seemed little short of a miracle that in June 2013, only eight months after I first learned about Kurd Qaburstan, I had a permit in hand and was digging with a crew of graduate students and specialists from Hopkins and elsewhere. As I had expected, working in a culture that was unfamiliar posed its challenges, but new colleagues and friends in Kurdistan helped us immensely. We had a successful first season and are returning in May. Despite my excitement about beginning a new project in a new country, I haven’t forgotten about my old archaeological home in Syria. Hearing the news every day about violence and destruction is heartbreaking, especially when I remember the fascinating country and warmhearted people I came to appreciate. It is particularly agonizing to hear about the disasters occurring in Aleppo, the main city of the north, since Aleppo was near my site, and I came to know it well. I became attached to its awe-inspiring historic architecture, old-fashioned ambience, and friendly people. Every time I drove down into the great bowl that the city is located in, it felt like going to a party. Having gotten to know Aleppo so well—and even learning to enjoy driving there despite its crazy traffic—I am saddened and dismayed by the suffering the city and its people have endured. As an archaeologist, I am also aware of the damage being done to the cultural heritage of Syria. This comes both as a result of the violence and from the looting of archaeological sites and museums that occurs during confusion and civil unrest. The Syrian Directorate-General of Antiquities has been valiantly attempting to monitor the situation and protect the sites and monuments, but this task is extremely challenging. Fortunately for me, my site guard, who lives with his family in the house we built for the expedition, reports that Umm el-Marra is still in good shape. I can only hope that this situation continues and that somehow peace will return to Syria.